Provide comfort for the family of Barbara Smith with a meaningful gesture of sympathy. 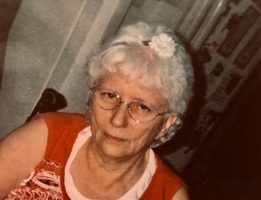 Leon - Graveside Services for Mrs. Barbara Ellen (Howard) Smith, 72 of Leon is scheduled for 2:00 PM Monday April 1, 2019 at the Leon Cemetery with Pastor Mike Sampson officiating. Services are under the care of Alexander Gray Funeral Wilson. Barbara was born on March 25, 1947 at Fleetwood, OK to the late Mr. Freddie Almon Howard and Mrs. Florence Beatrice (Lee) Howard. She departed this life on Wed. March 27, 2019 at Oklahoma City, OK.
Barbara was raised several places starting work at a very young age, picking cotton. She married Mr. Roy Edward Smith on April 2, 1963 at Gainesville, TX. They resided at several states and countries following his military career. Upon his retirement from the military they lived at Woodville and later moved to Leon in year 2000. Barbara worked lastly at the Brookside Manor in Madill as a dietician. She always loved to crochete and most of all enjoyed being with her grandchildren. Preceding her in death Parents; 3 brothers, Harold Howard, Albert Howard and Jerry Howard; 1 sisters, Mary Richards; husband, Roy Edward Smith, July 27, 2011; 2 sons, Ollie Smith and Randy Smith; granddaughter, Latalsha Mote and grandson, Michael Ruoff. Survivors include her daughters, Brenda Smith of Gainesville, TX and Kathy Smith and husband Abbas Hassanshahi of Leon and Tina Smith of Leon; sister, Wanda Harrison of Kingston; brother, Bobby Howard and wife Jenny of Madill; 15 grandchildren and 13 great grandchildren; numerous other family and friends. Family visitation will be held from 5 to 7 pm Sunday evening at Alexander Gray Funeral Home of Wilson. To send flowers in memory of Barbara Ellen Smith (Howard ), please visit our Heartfelt Sympathies Store. Provide comfort for the family of Barbara Ellen Smith (Howard ) by sending flowers. May the family of Barbara Ellen Smith please accept my sincere condolences hoping you find comfort in God's words at Acts 24:15 and Psalm 37:29.